Aesthetics – the Boker Stockman or the Queen Stockman? In this article, I will be comparing in great detail the Boker Stag Handled Stockman to the Queen Cutlery Amber Stag Bone Cattle King Stockman. These two will be put through their paces against the usual criteria that we rate and review all our knives against. Before continuing on with this head to head review, you should check out both the Boker Stag Stockman and the Queen Cutlery Amber Stockman on Amazon so you are familiar with the knives that we will be debating. The Boker Stag Handled Stockman measures 4 1/4 inches closed and weighs 2.9 ounces. In addition, it features a 3″ Clip Point blade, a 2 1/8″ inch Sheep's Foot blade, and a 2″ Spey blade made from 440C stainless steel hardened to 56-58 Rockwell. It also features nickel-silver bolsters with stag antler handle scales. 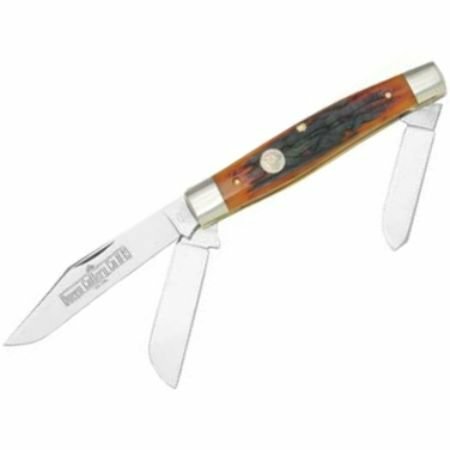 Last, the Boker Stag Handled Stockman retails for around the $139.95 mark, although discounts are to be had if you shop wisely. The Queen Cutlery Cattle King Stockman on the other hand, measures 4 1/2″ closed and weighs 4.0 ounces. Plus, it features a 3 1/4″ Clip Point blade, a 2 3/8″ inch Sheep's Foot blade, and 2 1/8″ Spey blade made from D2 semi-stainless steel hardened to 59-60 Rockwell. It also features nickel-silver bolsters with aged honey amber stag bone handle scales. Lastly, the Queen Cutlery Cattle King Stockman retails for $154.95. To me, both of these knives are very aesthetically pleasing! But, what really catches my eye first on any pocket knife (and I imagine other people's as well) are the handle scales. Having said that, I also have to say that natural stag antler has always held a special place in my heart as a knife handle material. But, I also happen to really like jigged, aged honey, amber stag, bone handle scales as well. Especially when they are complimented by nickel silver bolsters! Although round bolsters are easier on a person's pocket lining than square bolsters, I am afraid that I just don't like them nearly as well as square bolsters. I also have a distinct preference for polished primary blades as opposed to acid etched primary blades, even so, I find it extremely difficult to rate one of these knives over the other since they are both gorgeous knives. Overall, for aesthetics, I find the Boker Stag Handled Stockman to be slightly more aesthetically pleasing to me than I do the Queen Cutlery Amber Stag Bone Cattle King stockman and thus, I am going to award the points in this category to the Boker. For me, as well as for many people who prefer traditional pocket knife designs, the Stockman is the single most useful pocket knife design in existence for every day carry because of its three different blade shapes and thus, I have been carrying this design in one brand or another for over forty years now and in fact, I feel completely naked without one! The reason for my ardent affection for this design is that, of all of the traditional pocket knife blade designs, I find the Clip Point blade to be the single most useful design for general purpose use because it will perform most any job from opening a envelop, to cutting string and cord, to whittling. However, occasionally I encounter a job in which a different blade shape is better suited and when that happens, if I have my trusty Stockman in hand, I then have my choice between a Sheep's Foot blade with its straight edge and dropped point or a Spey blade with its extended sweep and deep belly. For instance, when I have a need to cut a the plastic from a merchandise package, I find that the Sheep's Foot blade the perfect tool for the job because it cuts like a utility knife. However, there are other times when I need to perform precision cutting or carving tasks with the tip of the blade and in those situations, I find the shorter length and extended sweep of the Spey blade is very handy to have. 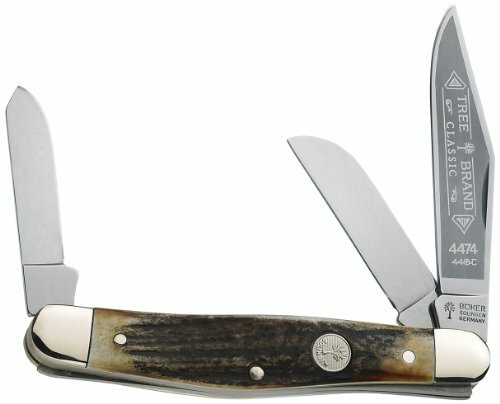 When I look closely at the Clip Point and the Spey blades of the Boker Stockman, I notice that neither has as much belly as the same blades on the Queen Cutlery Cattle King Stockman. I also notice the Clip Point blade as well as the Sheep's Foot blade on the Queen Cattle King Stockman are slightly longer than those used on the Boker Stockman and thus, I find that in this category, I have a distinct preference for the Queen Cattle King Stockman over the Boker Stockman. 440C is an American-made, high-carbon, stainless steel that was originally introduced to the knife industry by custom bladesmith Gil Hibben around 1966 and is generally considered to be a second only to ATS-34 for knife blades because it contains 0.95 – 1.20% Carbon, 16% – 18% Chromium, 0.75% Molybdenum, and 1.0 % Manganese with a typical Rockwell Hardness of 57-61. Therefore, it is a very hard, fairly tough, and extremely corrosion resistant blade steel that will hold an edge very well because Molybdenum forms hard, double-carbide, bonds with Chromium during forging. However, it lacks Vanadium which serves to refine the grain structure and thus, it will not take quite as fine an edge as blade steels that do contain Vanadium. D2 on the other hand is an outstanding a high-carbon tool steel containing 1.5% Carbon, 1% Molybdenum, 12% Chromium, and 1% Vanadium with a typical Rockwell Hardness 57-61. Thus, it is considered to be a semi-stainless steel that is often used to create steel cutting dies in most every tool and die shop in the U.S. because it can be hardened far beyond the favored 60-61 Rc. Consequently, this air hardening steel takes a really good edge and holds it exceptionally well while also remaining reasonably tough. In addition, although the first custom bladesmith to use this steel was Jimmy Lile, the strongest convert has been Bob Dozier who has made this steel very popular by mastering the heat treating process. So, in looking at the composition of these two stainless blade steels, I notice that 440C has a slightly lower Carbon and Molybdenum content than D2 which means that it will not hold an edge quite as well as D2. I also notice that D2 has a significantly lower Chromium content than 440C and thus, it will not be nearly as corrosion resistant as 440C. In addition, I also notice that D2 contains a significant amount of Vanadium which 440C lacks altogether and thus, D2 will take a noticeably finer edge than 440C. So, for pocket knife blades which will be subject to a myriad of different environments throughout their lifetime as well as to the humidity generated by the human body when carried in a pocket all day, I tend to prefer 440C over D2 even though D2 holds an edge better. The handle scales of the Boker Stag Handled Stockman are made from exotic Sambar Stag antler which is a beautiful, natural, handle scale material and is one of my favorites. In addition, this material is made from deer antlers that have been shed after the breeding season has ended which is then collected by humans who saw the outer layer of the antler into slabs. Therefore, it is a very tough handle material that does not require stabilizing and, because each antler is unique, each handle scale is unique as well. The handle scales of the Queen Cutlery Amber Stag Bone Cattle King Stockman are made from jigged bone that has been dyed to achieve a deep, rich, aged honey color and thus, the extra long name. In addition, since this handle material is made from bone, it too is a very tough handle material that also does not require stabilization. So, how do I rate these two handle materials? Well, since both materials are equally tough, choosing between the two is really a matter of aesthetics. Therefore, as I mentioned previously, because I have a distinct preference for stag scales over jigged bone scales, I am going to award the greater number of points in this category to the Boker Stag Handled Stockman. Concerning locking mechanisms, both of these knives feature a traditional Slip Joint locking mechanism which does serve to hold the blade in the open or closed position but does not “lock” the blade in place the way a Lockback or a Liner Lock mechanism does. The reason for this is that a Slip Joint mechanism is constructed exactly like a Lockback mechanism in that a leaf spring is stationed between the liners and pinned in the center where it can pivot on the pin and then. The spring is secured at the opposite end by either resting on the tang of another blade or against a stop. The tang of the blade on a Slip Joint lacks the notch that is milled into the tang of a locking blade and thus, the spring is allowed to “slip” around the end of the tang instead of locking. Consequently, if too much pressure is applied to the tip of the blade, the blade will unexpectedly fold into the closed position which can be a problem if your fingers happen to be in the way at the time. However, the Slip Joint is a mechanism that is common to all traditional pocket knife designs and thus, this is something that you simply have to be aware of and act accordingly when using a traditional pocket knife design. On the other hand, a Slip Joint does not require two hands to close the blade the way a Lockback does because, by simply placing the spine of the blade against a body part such as the side of your thigh, you close the blade simply by applying enough pressure to overcome the spring. * Due to fluctuations in the market, and special discounts – you should check the prices of both knives on Amazon to see the most up to date price. View the Boker Stockman and the Queen Cutlery Stockman on Amazon to check the latest prices. Although I am inclined to choose the Boker Stag Handled Stockman over the Queen Cutlery Amber Stag Bone Cattle King Stockman because I have a major love affair with stag antler and 440C, my little voice keeps telling me to choose the Queen Cattle King Stockman instead. Thus, I am really torn between these two knives because I like them both so very much. But, in this case, I am going to go with my gut feeling and choose the Queen Cutlery Stockman. Last, in adding up the numbers, I see that these two knives have actually come out as equals on the Folding Knife HQ ranking chart which I had not really expected when I started this article. All things considered, I have to say that I am not really surprised since they are so evenly matched to start with. Very fun commentary, I own both knives and agree with your thoughts and comments. I lean ever so slightly toward the Queen but am sold on the quality of the Boker as well. Thanks for commenting Dan. Let’s be honest, you can’t go wrong with either of these knives! One important opportunity to distinguish between these knives was missed… In a working slip joint knife, I strongly prefer the security of knives requiring more force to close. I would have enjoyed this comparison as it would tip the scale in this review.